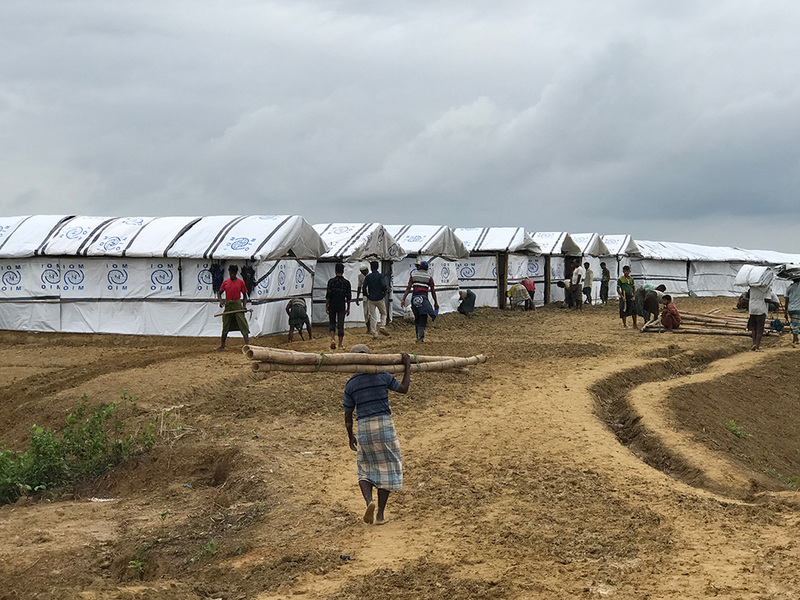 Cox’s Bazar - Hundreds of new temporary shelters are being built each week by IOM, the UN Migration Agency, in a rapid response project to create safer homes for thousands most at risk from landslides and flooding in Bangladesh’s Rohingya refugee camps. Over 600 Rohingya refugees are working alongside IOM staff in cash for work programmes to construct the new shelters using specially developed systems which allow for rapid construction of structures robust enough to withstand tough, monsoon conditions. But with another cyclone season on the horizon, months of rains ahead, and the refugee response in Cox’s Bazar facing a major funding crisis, more international support is urgently needed to help hundreds of thousands of people who remain at risk. Almost a million Rohingya refugees who fled violence in Myanmar are now living under tarpaulins on the steep, sandy slopes of the district in southern Bangladesh, which suffers from some of the heaviest monsoon rains in the entire region. Around 200,000 are currently assessed as being under direct threat from landslides and floods. Although humanitarian agencies have already relocated around 23,000 of those most at risk, tens of thousands more urgently need to be moved to safer ground, with numbers predicted to grow as worsening monsoon conditions set in. The IOM shelter teams and refugees involved in cash for work programmes are constructing as many as 50 new emergency shelters a day to house those most affected, including some of those hit by recent storms which caused dozens of landslides, destroyed shelters and claimed a number of lives. Previously most refugee families built their own shelters after receiving materials and training from IOM. Assistance with construction was only given to those identified as most vulnerable, such as the elderly, disabled, or lone parents. But with heavy rainfall increasing the number of those at risk, and rising numbers of people seeking to relocate, IOM has stepped in to speed up the process. The emergency shelters are being erected on land newly prepared by IOM and its partners, working with thousands of Rohingya refugees and local villagers as part of the Site Maintenance Engineering Project (SMEP). The SMEP, a joint project with WFP and UNHCR, has made large areas safe for relocation in just six weeks. The shelter teams are on target to complete 1,500 new shelters by the end of July, providing safer homes for an estimated 7,500 people. But with another cyclone season approaching, more resources are urgently needed to continue the work and reinforce shelters with more durable materials across the camps. “The speed and scale with which this ground has been prepared and these emergency, temporary shelters are going up is a testament to the effort of IOM staff and the Rohingya refugees themselves, who are all working tirelessly to create a safer environment for the most vulnerable in the refugee community,” said Giorgi Gigauri, IOM Chief of Mission in Bangladesh. But he noted that the overall Rohingya response is still only one quarter funded. IOM’s appeal for USD 182 million to support the refugees with lifesaving services and infrastructure, including shelter, through year end, has secured just 23 per cent of money it needs. “We are just at the beginning of monsoon and still have another cyclone season ahead. The grim reality of funding shortages is that we are having to make the near impossible choices about which vital services to restrict or delay. This is a highly dangerous position to be in,” said Gigauri. “Ensuring people’s basic shelter requirements are adequately met during these adverse weather conditions is absolutely vital if we are to avert unnecessary suffering and life-threatening health and safety risks,” he added. Among those IOM recently helped move to the new shelters was 65-year-old Nur Begum. She was widowed shortly after arriving in Bangladesh from Myanmar last year. She described watching the land next to her previous shelter collapse during this month’s storms. "I was in Balukhali [camp] before, but there was a high risk of landslides and I was very frightened," she said. "I witnessed a landslide just beside my house and thought I would die there. My sister and I came here to the new site to save our lives,” she said. "IOM brought us here to this new area where our shelter is strong and safe. We hope here we can have peace." For more information please contact Fiona MacGregor at IOM Cox’s Bazar. Tel. +88 0 1733 335221, Email: fmacgregor@iom.int.